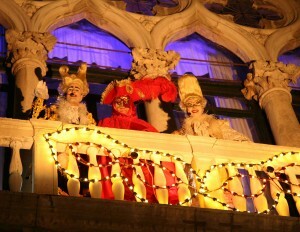 In the magical night of the Carnival in Venice 2014 , candlelight in the most charming Palace of Venice, facing the Grand Canal, among precious scenes and the 18th frescos, you’ll be the welcome guests at the Mask Ball “Mascheranda” Serenissima Venezia . At the arrival in the Main Saloon richly decorated a mysterious welcoming aperitif will be served delighted by a surprising artistic performance . The masked guests will then be invited to go upstairs , where , lodged in the Guarana , Tiepolo, Longhi Saloons and in all the others , a Grand traditional Gala Dinner will be served , with a live classical music performance , the Dancers and the Comici dell’Arte -with the Wonder Frames- entertainments introduced by Casanova . During and all along the night , music , fantasy, entertainments , colour and warmth, will be the frame for the magic of the Party going on with the Casanova of the Year Election and the School of Historical Dances with the Master of Ceremony , the Boudoir “Enchanting the Senses” , the Belly Dancers and the great Mask Ball in the Main Saloons with surprises and games based on the theme of the Party. Open Bar available for the guests all night long included in the price .